Back in 1985 Alessandro Serri and Edmondo Romano founded Eris Pluvia, a concept of fusion between ancient and modern sounds. In 1991 they arranged their own compositions for the wonderful album “Rings Of Earthly Light”, one of the most appreciated progressive rock albums of those years. In the year 1992 Alessandro and Edmondo left the band and together with Fabio Serri formed the project Ancient Veil. In 1995 Ancient Veil released an album under the name “The Ancient Veil”. Your reviewer is a proud owner of both albums. The “Rings Of Earthly Light” album is still a classic album. The new Ancient Veil album is entitled “I am Changing”. To make it a little confusing the band Eris Pluvia is still active and has just released a new album entitled “Different Earths”. The band told me that they were out of physical promo copies, so I can't give you a comparison between both albums. As you probably know, the reason that progVisions is reviewing albums on basis of physical promo copies is a quality issue. Edmondo Romano was happy to provide me with a physical promo copy of the new Ancient Veil album “I Am Changing”. The album opens with a track called “Bright Autumn Dawn”. The synth sounds of the opening are bringing immediately some memories of that “Rings Of Earthly Light” album of Eris Pluvia. This supports my opinion that Alessandro and Edmondo were the driving force behind that beautiful debut album of Eris Pluvia. Later on the flute work and rhythms will bring the names of bands like Jethro Tull or Solaris into your mind. Halfway the song the piano introduces a beautiful classical theme with strings and oboe. A piece of music of unparalleled beauty. The next song “If I Only Knew” also reminds me of the early Eris Pluvia. This is because of the recognizable voice of Alessandro with that charming little accent, the guitar solo in the end and the recorder sound of Edmondo. The music of Ancient Veil is still an mixture of mellow Prog and ancient classical music.“ You Will See Me (Intro)” is a short instrumental piece of music with beautiful recorder melodies and classical strings. Then it is time for the title track of the album “I Am Changing”. The instrumentation and diversity of this piece is wonderful. Every instrument is chosen with care and every part is played with a kind of delicacy. “Only When They're Broken” has a beautiful chamber orchestra like opening. The melodies on this track are very beautiful, but this counts for the whole album. You can find lovely acoustic, classical and twelve string guitar parts in this track. One of the longer tracks of this album is “You Will See Me” that counts almost 6 minutes. The use of both male (Alessandro Serri) and female (Anna Maria) vocals gives this track something special. I also like the synth parts in this little gem. The short “Fading Light” opens with a piano intro before it becomes more heavy with nice Hammond, Moog and electric guitar work. Well heavy is maybe the wrong word because the music stays on the mellow spectrum of progressive rock. In “The Fly” you can find twelve string guitars and uplifting vocal melodies. In the opening of “Chime Of The Times” vocalist Valeria Caucino sings a beautiful vocal part and Edmondo plays a beautiful clarinet part. Halfway the song the several recorders of Edmondo gives the piece a somewhat ancient character. In the short “On You Will See Me (Finale)” the Moog of Alessandro meets the grand piano of Massimo. With a duration of almost seven minutes the last track “A Mountain Of Dust” is the longest composition of the album. A melting pot of ancient and modern music with the use of beautiful instruments like oboe (Marco Gnecco) and the French pipe of Edmondo. The first album of Ancient Veil was not so strong then the debut album “Rings Of Earthly Light” of Eris Pluvia. 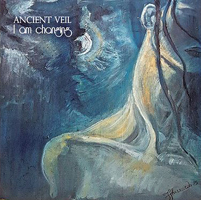 But if you liked that early Eris Pluvia album you have to buy this Ancient Veil album “I Am Changing”. Maybe it is not coincidental that the trio Fabio Serri, Alessandro Serri and Edmondo Romano are photographed before the original painting of the cover of the “Rings Of Earthly Light” album. You can find that photo on the back of the CD booklet. The second Ancient Veil album “I am Changing” is a little gem full of wonderful melodies and has a great instrumentation with instruments from ancient and modern times. An album of pure beauty. If you like the mellow side of Prog and are open minded towards ancient and classical music this album is for you!